Holiday baking is always a favourite of mine. I remember that when I had the time, I would make a ton of Christmas cookies and give them out as gifts. Alas, this year I fear with my very busy schedule that I might be unable to make a single cookie. So I will be living vicariously through our bakers as they tackle three holiday-themed challenges with a spot in the semi-finals at stake. What I Would Make: I would make a peppermint candy can roll. I would add a red spiral pattern to the white sponge. The cream would be a peppermint one and topped with crushed candy canes. Birch tree Yule log with candy cane pieces. Rochelle thought there was too much white chocolate frosting. Bruno thinks it is too sweet. Chocolate cherry buche noel with cherry jam. Bruno and Rochelle liked the spiral. Bruno called it delightful. Pumpkin Caramel roll with candied cranberries. Bruno thinks it looks technically great but the ratio between filling and spong is off. Despite that, both thought the flavours were very holiday. Chocolate orange roll with a chocolate bark pattern. Rochelle thinks the log looked great unlike his previous bake. However, Rochelle noted the lack of a spiral of his sponge. Bruno and Rochelle like the flavours. Gingerbread spice roll with egg nog filling. Bruno liked the softness of the sponge. The Bake: 16 Chocolate and 16 apricot ruggulah for a total of 32. The Time: 1 hour and 45 minutes. I’ve actually made ruggulah. However, I used premade pie crust to make my Nutella version. So I really don’t know how to make one from scratch. It looks like all of our bakers under-baked their ruggulahs. What I would make: I’ve never made a gingerbread house from scratch but I think my structure would be based on my house and decorate it with a festive theme. I would even include the magnolia tree in front. Gingerbread dream house. Bruno thinks her structure had too much decorations. Rochelle liked the spice on the gingerbread. Gingerbread barn. Rochelle liked the creativity of Linda’s structure. Bruno also liked the taste and Rochelle called it exceptional. Gingerbread Rockefeller Center. Rochelle noted that the back of her structure had no decorations and Bruno wanted to see more technique. Luckily, Bruno liked the taste of the gingerbread. Gingerbread Treehouse. Rochelle is impressed with the attention to detail on the structure. 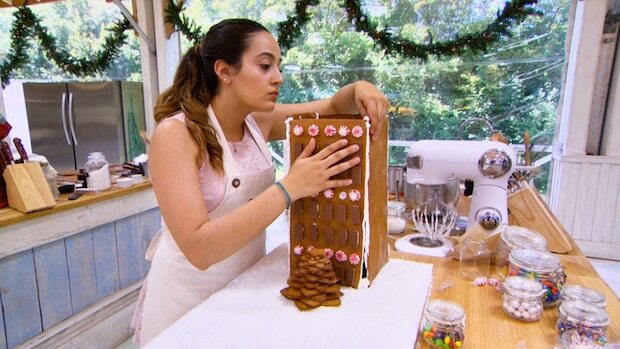 Rochelle liked the spice on the gingerbread but it was almost over-baked. Gingerbread Eco-Home. Rochelle liked the sugar glass on the structure and his piping work. Bruno thinks the cookie is a bit crunchy. Star Baker: Vandana – second one in a row. Next Week: It is the semi-finals. Sabrina needs to step it up and so does James. Because if they don’t Vandana is going to take this home. It is French Pastry week. It looks like one of the challenges is making a croquembouche, which I made one a few Christmases ago.